So, good news for us ? We sometimes forget that the GA and even some big fans have no clue what's coming next! Of course, not everyone is upset about that, just some rather vocal groups online. But I do think there is an air of uncertainty or mystery, or general confusion regarding what's going to happen. Most viewers aren't doing in-depth analysis, so it looks like the big bad is dead, Luke and Han are both dead, Kylo Ren is SL, and Rey is a Resistance hero Jedi. On the surface level, Reylo and even redemption are not obvious. It will indeed be quite shocking to many. What if the Jedi don't get reestablished, or they are dramatically different than they were before? Heads will explode. Can't wait to see the reactions. I suspect that HUX is going to have a bigger role and possibly be the big bad in the next movie. Most fan discourse and GA think his role is completely comical but that is not what I saw at the end of TLJ. I have to admit that surprised me the most. @Birdwoman wrote: I suspect that HUX is going to have a bigger role and possibly be the big bad in the next movie. Most fan discourse and GA think his role is completely comical but that is not what I saw at the end of TLJ. I have to admit that surprised me the most. Agreed. He was already frothing at the mouth and over the top when he launched SKB, TLJ only heightened the ridiculousness he already had. He is in the position Kylo was in at the end of TFA, where much of the audience thought he was a joke and shouldn't be taken seriously. There was little discussion about the character at all before TLJ. That's not even really a conversation anymore, I don't see "Kylo Ren is a wuss" discourse going around much now. Hux taking out his blaster to kill Kylo and then staring daggers at him is even less subtle than Kylo being sad. Hux hasn't even really changed, he just has more opportunity to enact all the terrible things he wants to do, and he sees Kylo as an easier target than Snoke was. Like it's kind of amazing how on the nose and not at all hidden his animosity and even bloodthirst for Kylo is. Come IX, I think a bunch of people might end up wondering how they didn't see this coming. Yeah, he is a Reylo. Not some scooper like MSW, just a normal fan. The vibe I get that it's something more shocking than a Reylo kiss/Kylo redemption etc. as at least a substantial amount of people can suspect that even if they don't agree with where it's going. Remember, TLJ had some pretty big twists that took the fandom by surprise big time, Luke/Kylo backstory, Snoke dying, Luke dying, force projection, Kylo becoming Supreme Leader etc. It was the first SW movie in forever that was really unpredictable. So if it's potentially more shocking than that... I'm honestly expecting something huge. Domhnall: "You can look forward to J.J. doing what he does so well. It will be epic, but it will also be surprising." Todd Fisher: "He (Todd Fisher) said there were big surprises coming – big surprises with this movie, this performance, and the unused footage – and said – this one is really for the fans." It can be hard to predict the story in the series with what basically amounts to magic powers. Reylos speculated about the force bond, but I don't think anyone predicted the force projection exactly as it was in the film - and it had a huuuge impact on the story and character dynamics. They could very well come up with another magical force device to propel the story. Also, the "how" of redemption can still be a surprise even if you're generally aware of its possibility. Before TLJ I was certain that the movie would reveal some sympathetic backstory for Kylo, but though I expected it in general the specifics of Luke/Kylo backstory still took me by surprise. I think something that would be shocking for everyone regarding Kylo's fate (even though it has already been speculated here) would be Reylo being rulers of the galaxy at the end. Another posibility: Rey and Kylo becoming one entity (kind of like The Prime Jedi). I think Reylo is almost a given. What could be shocking is Kylo's fate. A lot of people think he will die in IX even if he gets redeemed so perhaps the shocking bit would be that Kylo & Rey end up alive and well in a happily ever after forming a new Jedi order. Fingers crossed! Plus we don't know if this insider the guy is talking about is anything reliable. Perhaps the supposed insider is just messing with him. Ok am gonna post it here since it’s Mike Zeroh( sorry !) but basically his latest two videos are about plot leak and that reylo is happening . He says first week of October Adam driver and daisy Ridley will Be filming intimate scenes and emotional ones along the lines of the hut scene and also that the first order is hiding in the unknown regions and that mutes the force bond but as rey gets closer to kylo there the bond gets stronger. There’s also something there about the kids in the unknown regions and I thought chiss ascendancy for some reason because their kids are force sensitive. There is more about the force bond but need to have another listen because it was late last night that I had a listen . I don’t know where he is getting the info from and alleges it’s plot leaks and insider knowledge but he doesn’t claim to know everything. He says he’s trying to piece it as he hears stuff .Anyway have put it here in crack leaks as haven’t heard it anywhere else . Ok re- listening so will add as I listen - it is the chiss children that lead Rey to a planet in the unknown regions - a planet that will benefit rey . That Kylo and rey’s Force bond has been muted but when she enters the unknown regions the bond opens and they connect on another level ( though what that means I don’t know ). So it looks like there is something in the unknown regions that interferes with the force . The bond is cut off until rey enters the unknown regions as kylo’s base is there and the closer she gets to him the more it opens . Oh and hux is a mole in first order because he feels betrayed . I can’t remember if this was one of the leaks we heard in May or not if it is my apologies ( my poor memory!). Take this with grain/pinch of salt ( even Mike Zeroh says this lol!). @AhsokaTano wrote: Ok am gonna post it here since it’s Mike Zeroh( sorry !) but basically his latest two videos are about plot leak and that reylo is happening . He says first week of October Adam driver and daisy Ridley will Be filming intimate scenes and emotional ones along the lines of the hut scene and also that the first order is hiding in the unknown regions and that mutes the force bond but as rey gets closer to kylo there the bond gets stronger. There’s also something there about the kids in the unknown regions and I thought chiss ascendancy for some reason because their kids are force sensitive. There is more about the force bond but need to have another listen because it was late last night that I had a listen . I don’t know where he is getting the info from and alleges it’s plot leaks and insider knowledge but he doesn’t claim to know everything. He says he’s trying to piece it as he hears stuff .Anyway have put it here in crack leaks as haven’t heard it anywhere else . If only this was true! Here's hoping that at least the intimate and emotional scenes between Kylo & Rey will happen! Cannot wait. That sounds like a combination of Foofy's leak and a FAF from a while back where Hux was a mole. Yeah the hux is a mole thing rang a bell and thought had heard it before . Richard E Grant is Obi Wan? OK, of all crack this one takes the cake. Also, it's another leak that tries to make the lead out of Luke. He's not dead. he's dead but higher level of ghosting, almost like he's alive. He's so solid he fights. @vaderito wrote: Richard E Grant is Obi Wan? I know, right? The Luke stans are like Rose at the end of Titanic... “I won’t let go, Ja...er, Luke! I’ll never let go!” (as Celene Dion power ballads in the background). Crap... Now I have to figure out how to make that a Gif. If I sound bitter it’s only because YouTube keeps throwing all these “TLJ was garbage and you’re garbage for liking it” videos (though they’re not so obviously titled) into my Recommended For You list even after down voting every last one. It’s been nearly a year and these people just can’t let it go that someone somewhere might actually like where the ST is going. I want IX to be so Reylo heavy that you sometimes forget it’s supposed to an action flick, Luke to only show up a Force Ghost to smile and give a thumbs up to the audience when Reylo start to make out and end up with a box office of $1.5+ billion just to SPITE them. As to the crack itself... given all the endless “Ewan McGregor desperately wants to do an Obi-Wan movie and it’s 100% in development and will save the franchise” screams from the madhouse, I almost want to buy the “Grant is playing Obi-Wan’s Force ghost” crack just because it would be such a gut punch to them. Almost. But yeah, I put this up there with Luke’s severed hand floating through space as the opener for TFA level of Crack. your comments made me chuckle @vaderito - luke now another level of ghost , higher than all the others and also Richard E grant as obi wan has been doing the rounds on Reddit for a few weeks now as people’s wish list as some think he has similar bone structure to Alec Guinness. Lol! 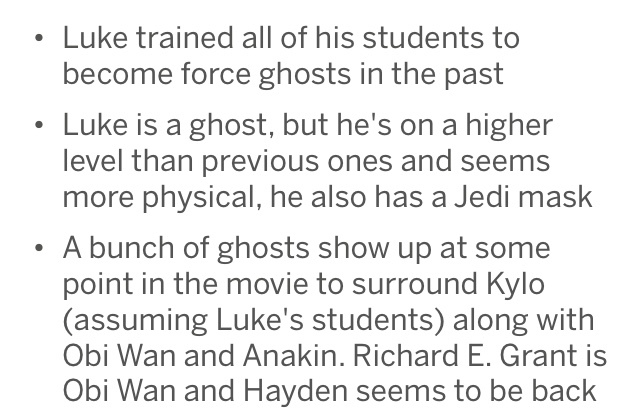 Also by saying Luke trained all his students to become force ghosts that would include Ben presumably too and so could imply he ends up as one . There aren’t many comments on this post at the moment but maybe someone will ask that ie will Ben end up as a force ghost . Would make his dead kind of pointless in TLJ. Also- the ST is NOT about Luke. When did they ever going to accept that? hey we are going to resurrect Carrie Fisher footage to have proper Leia in the movie, but we'll cast Richard E Grant as Obi Wan despite alive and kicking Ewan McGregor and tons of Alec Guiness footage. If Richard E Grant is Obi Wan, then Keri Russell is Mara Jade (and Rey’s mum) right? JJ will save the Skywalker Saga after Rian tried to sabotage it! I just hope that whichever character REG plays, he hams it up like being Seward in Dracula. And if y’all think suggested angry YouTube videos are something, some of the responses to Jason Fry posting a shout out to a 4 minute tongue-in-cheek public service announcement are pretty entertaining. Especially when you recognize some of the responders and how a certain discussion lives on despite their best attempt to stifle it. What the ...??lol!!! I haven’t looked at latest comments but that’s absolutely bonkers ! It does however sound like the scene in deathly hallows and in goblet of fire when Harry confronts Voldemort and all the ghosts appear to encourage Harry. It works in Harry Potter because it’s Harry Potter but in Star Wars this would be atrocious I think anyway. This is obviously where this “ poster” got the idea from and I like the way they say that it’s now being re- written like a disclaimer lol! 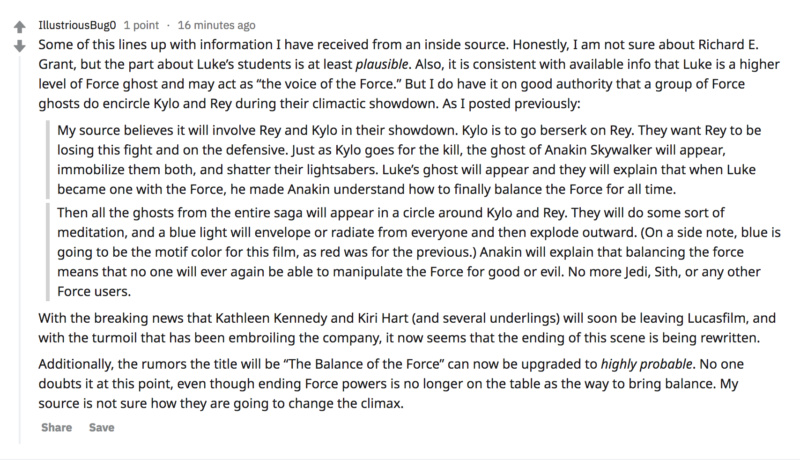 lol I'm just imagining the force ghosts surrounding Kylo and Rey thing and it's so unbelievably lame to me.If this is what the pissed off fans want,I'm really glad they're mostly wrong in their expectations.I mean seriously the idea that the balance of the force is achieved by Luke becoming so powerful that he teaches Anakin how to balance it and it's all done offscreen in force ghost world I guess.It sounds so dumb. FWIW, if you read the guy's one other post, it's clear that he has issues with KK. He's likely just trolling/trying to get fanboys stirred up with the anti-KK (and anti-Kiri Hart) comments. I’m unsure how the supposed imminent departure of KK would warrant a climatic scene to be re-written? There is much emphasis on a ever powerful Luke heading up a life force possee which could include everyone from Yoda, Mace, Qui Gon and Kit ? All communing and meditating to tone down that showndown?